In October, when Andhra Pradesh Chief Minister N Chandrababu Naidu launched “brick-donation” progra- mme to build Amaravati as the state’s new capital and the country’s most modern green city, it rekindled hope in Markand Majhi, who lives hundreds of kilometres away in Odisha. The 61-year-old marginal farmer from Khamatri, an arid village in the poverty-stricken Nuapada district, faces the spectre of losing 60 per cent of the paddy crop on his field as monsoon has ditched most parts of Odisha this year. But following Naidu’s announcement, he hopes to tide over the losses by making the most of his talent in brick making at Amaravati. Majhi, who has mastered the art by working as a migrant brick maker in the past 13 years, is among the hundreds of thousands of marginal and landless farmers in western and southern Odisha who form the majority of brick-making labour force in neighbouring Andhra Pradesh, Tamil Nadu, Telangana and Karn ataka. While the Odisha government data shows that nearly 136,000 labourers migrated out of the state between 2011 and 2014, unofficial sources peg the figure at 300,000 a year. 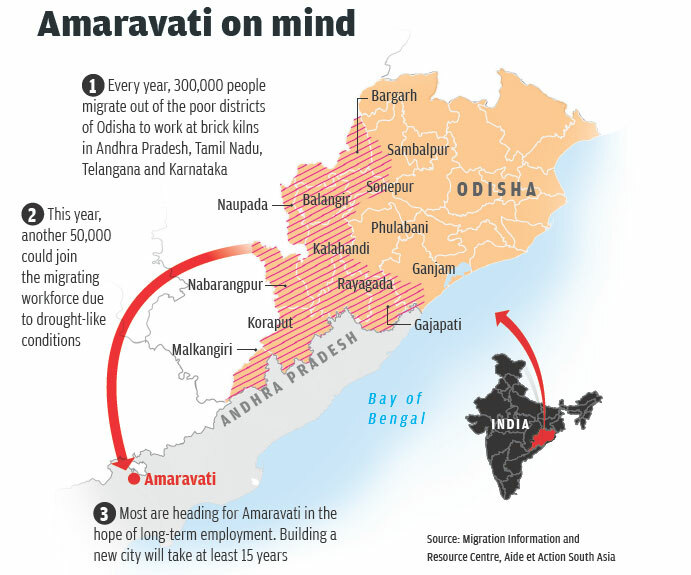 Another 50,000 could join the migrating workforce this year due to the prevailing drought-like condition in the state, particularly in the backward districts known for distress migration (see ‘Amaravati on mind’,). These labourers usually get ready for migration as the kharif (summer) crop season comes to an end towards September, and return home before the next kharif season begins. “This provides us assured work throughout the year,” says Markand. But this year, his hope is giving way to fear of not getting sufficient remuneration. Last year, 62 families migrated out of his village. 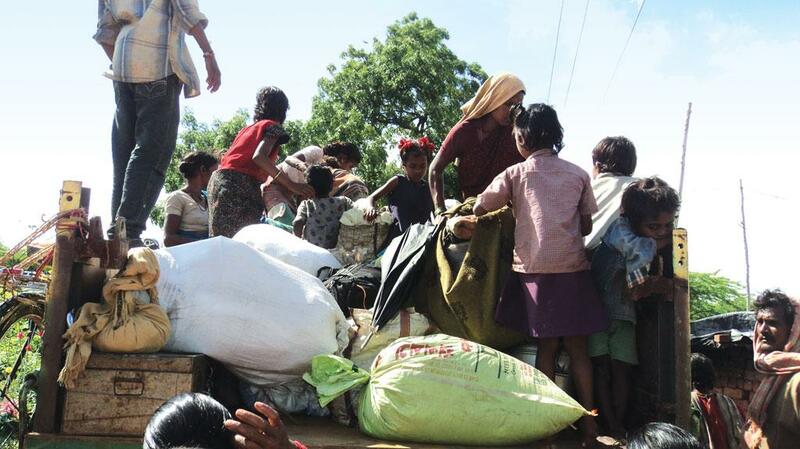 This year, 120 families are preparing to migrate, and all of them are planning to go to Andhra Pradesh. Majhi fears that such high influx of migrant labourers would pull down the wage rate, which is already very low. In Andhra Pradesh, a pathuria (a family of labourers comprising father, mother and a child) receives around Rs 350 a day. This is when the Odisha government’s minimum wage rate for skilled labour is Rs 270 per day per person. Markand’s neighbour, Chhabi Majhi, told Down To Earth that agents, who arrange work for the migrant labourers, have already reached a mutual understa nding with brick kiln owners to lower the wage advance to less than Rs 50,000 this year. Brick kiln owners usually pay six months of wage in advance to migrant labourers before they travel to the work-site. Last year, the work advance was between Rs 50,000 and Rs 70,000, informs Chhabi. Worse, most of the migrant labourers have taken loan from private moneylenders at a high interest rate and would not be able to pay back due to crop failure this year. So they have started clearing the debt from the wage advance. This means, they will work for the next six months without any wage, and return home penniless. Analysts say it will take at least 15 years to build the new city, and the real estate boom around it will continue for over two decades. This will assure migrant labourers with long-term employment, but will leave them vulnerable to accepting paltry wages, long working hours and unforgiving working conditions. Brick kiln owners deploy different tactics to retain labourers. There have been instances where employers withheld wages of labourers or confined their children to force the labourer family to extend its stay at the brick kilns. “Migrant labourers are also forcibly confined to the work-sites. If they try to flee, they are physically assaulted,” says Dayasagar Pradhan, a social activist who has lived near brick kilns in Andhra Pradesh for a decade and seen the labourers being tortured from close quarters. Brick kiln owners in Andhra Pradesh are in a hurry to scale up their operations, but are waiting for the desperation in these poor areas to grow so that they can cash in on it. An effective way to prevent such distress is to create enough employment opportun ities in drought-hit villages. The Naveen Patnaik government has already declared 139 of the 314 blocks in the state drought-affected and has assured 200 days of employment in a year under the Mahatma Gandhi National Rural Employment Guar antee Act (MGNREGA) to the residents. But this is ambitious given that the government has barely managed to provide 45 days of employment per household during the past three financial years. So far this year, the government has provided only 27 days of work under the Act. Delay in wage payment has further made MGNREGA unpopular among people. “At least we get regular work and timely wages by working at brick kilns,” says Sumati Majhi, who has been migrating every year to distant cities to work at brick kilns since her marriage 20 years ago. To protect the interests of migrant labourers and to ensure their safety, the Odisha government in 2012 signed a memorandum of understanding (MoU) with then Andhra Pradesh government. While the Andhra Pradesh government had agreed to take steps to protect labourers’ rights by ensuring payment of minimum wages, suitable working conditions and health services, the Odisha government had agreed to ensure that labourers migrate to Andhra Pradesh through a proper registr ation mechanism. The arrangement had yielded reasonable results. But the MoU stands invalid following bifurcation of Andhra Pradesh. “In June this year, we sent letters to both Andhra Pradesh and Telengana to renew the MoU and protect the rights of labourers,” says P K Tripathy, Assistant Labour Commiss ioner of Odisha. “But we are yet to receive any response,” he says. Daniel says the state government cannot run away from its responsibility by merely sending letters. Top officials of both the governments need to have extensive discussions on protecting the basic rights of labourers who are forced to migrate in the absence of livelihood opportunities in their own state.